It was May 1775 when Judah Moffat helped capture Fort Ticonderoga from the Redcoats. More than two centuries later, he'll be portrayed by one of his descendants in a movie reenactment of that crucial Revolutionary War battle. Now only three years older than his ancestor was then, 41-year-old John Fusco also wrote the screenplay for Rebels, which will go before the cameras this spring. He anticipates the film will be released by Touchstone at the end of the year. The $35-million motion picture highlights Ethan Allen, the heroic, cantankerous, controversial commander of the Green Mountain Boys. "My take on him is as a warrior-philosopher-statesman who was a master of political theater and psychological warfare," suggests Fusco, a Vermont resident since the mid-1980s. The movie traces Allen's tireless campaign to free the Colonies from British rule — a journey that brought him from Vermont to upstate New York and Quebec, where he was arrested after also attempting to liberate Montreal. Hand's Cove in Addison County is the designated Rebels location on this side of Lake Champlain. But according to the state film commissioner Loranne Turgeon, negotiations are in progress to include more Vermont terrain in the shooting schedule. Director David Cunningham is expected to spend time this month conferring with Fusco at the writer's home near Stowe. Thirty-year-old Cunningham was tapped because producers were impressed with his upcoming film, To End All Wars, about the hardships endured by Allied POWs building a railroad through the Burmese jungle in the 1940s. Fusco first broke into the entertainment industry in 1986 by penning Crossroads, followed by such major productions as Thunderheart in 1988 and Young Guns in 1992. He has a debut novel coming out next month and no fewer than three other films in the pipeline for 2002. But given the blood ties to Judah Moffat, Rebels is close to his heart. "Ethan Allen has long been my hero, mostly for his philosophical writings that can stand with the best of Thomas Jefferson," Fusco notes. When it came to snaring Fort Ti, as locals like to call it, Allen was among 83 Green Mountain Boys who paddled their bateaux across the lake at daybreak. "This big turning point was really a kind of comic opera," says Fusco. "They captured the fort from sleeping British soldiers." Legend has it that Allen declared victory "in the name of the Great Jehovah and the Continental Congress," but one fellow combatant later recalled that his statement was more along the lines of: "Come out of there, you goddamn rat!" References to the divine aside, Allen was a free thinker, and in Fusco's screenplay, the character remains true to those anti-religious views. "The Green Mountain Boys were uncommissioned and considered outlaws," he says, noting that each of these ragtag warriors without uniforms signified allegiance to the cause by tucking a pine sprig in the brim of his three-cornered hat. Allen and his volunteer militiamen were also renowned for their drinking habits. Opponents called them "the Bennington mob" in recognition of the town where they regularly gathered to strategize and imbibe at the Catamount Tavern. The English governor-general of New York referred to the "Boys" as "a collection of the most abandoned wretches that ever lived." Although the enemy's name-calling probably went too far, Fusco does acknowledge that he has created "a pretty rum-soaked movie... My portrait of Ethan Allen will be multi-faceted... warts and all." Turgeon shares that assessment. She had a sneak preview of the script before helping Fusco scout locations. "The film shows Ethan Allen not as the golden boy, but as a real, live person who had struggles," she observes. "He was brave and crazy." The lead role hasn't been cast, and Fusco says he cannot provide any insider information. "Based on the actors who we are considering at this time, most moviegoers will not know the name instantly unless they are fans of the New York and London stage," he teases. Fusco says he would like Jim Jeffords to play Governor Thomas Chittenden, despite the fact that right-wing tabloids characterized the U.S. senator as Benedict Arnold for his decision to leave the Republican Party last year. There are a few parts for women — in particular, widow Ann Story, dubbed "the Mother of the Green Mountain Boys." To ensure what he calls "good karma," Fusco has given himself only one line in the scene that shows his forebear reporting for military duty: "Judah Moffat, up from Connecticut." While Fusco was growing up in Connecticut himself, his Italian blue-collar father Giovanni owned an automobile junkyard. Hence the title of his son's semi-autobiographical novel, due to hit bookstores February 1: Paradise Salvage. His mother, Mary Isabel Moffat, is a direct descendent of Judah on the Scottish side of the family. "I never really tallied up the great-greats," Fusco says of his lineage to the Green Mountain Boy 11 generations back in time. Through genealogical research, he learned that members of the Moffat clan were trench diggers for William Wallace, Scotland's illustrious 13th-century freedom fighter. In the New World, Judah was a common laborer who headed north with Ethan Allen's cousins, Remember Baker and Seth Warner. Fusco headed in the opposite direction after dropping out of high school at age 16. He hitched to the Mississippi Delta to explore the roots of American popular music. After a homeless period in New Orleans, he joined The Dixie Road Ducks — "a poor man's Lynyrd Skynyrd" — as lead singer and songwriter. "We toured the South in a renovated '67 school bus with Confederate flags flying," Fusco recalls. "One night, I asked myself: 'Why am I doing this?' So, I returned to Connecticut, cut off all my hair, went to night school for a GED, then on to community college before being accepted to the dramatic writing program at New York University's film school." After graduation in 1982, he managed to interest Columbia Pictures in his bachelor's thesis, loosely based on those good-old-boy days in the Delta. That became Crossroads, in which Ralph Maccio appears as a teenager on a quest to find a lost tune by blues legend Robert Johnson. Although critic Pauline Kael did not mince words in denigrating the fledgling screenwriter as "John (one-piece-of-information-per-scene) Fusco," the Walter Hill film with a Ry Cooder score gained a big following. The film brought Fusco to Los Angeles, but he fled a few years later, in 1986, with Richela Renkun, an actress-photographer whom he met while still attending community college. They married and resettled in Vermont, where his father had long owned a fishing camp in Stockbridge. At first they lived in a log cabin next to a trout pond, then moved 10 years ago to a rural setting outside Stowe. The couple now has an 8-year-old son, Giovanni. They also have horses. 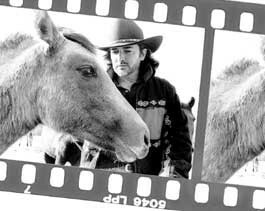 On the set of Young Guns, a cowboys-as-hunks adventure, Fusco fell in love with American paint ponies and began a program to restore original Native American herds. This expertise made him a natural to write the script for Spirit: Stallion of the Cimarron, a DreamWorks animated film. It's scheduled to open on Memorial Day. "It's an epic story of the American West told from a horse's point of view," Fusco explains. "This came about when Steven Spielberg called me — and you never take that lightly — with his one-sentence idea." Fusco's trip to DreamWorks four years ago for initial discussions about Spirit resulted in pure serendipity: That's where Turgeon then worked in animation development. "I was assigned to give him a tour of the studio," she says. "When I noticed that he was flying in from BVT — Burlington. I thought, That's weird." Fusco told Turgeon, born and bred in Newport, that there was a gig opening up back home that might be just her cup of tea. "He also recommended me for this job," explains the executive director of the Vermont Film Commission. "John is terrific. He's an A-list writer. There's nobody better." That A-list now seems to have Fusco firmly in its grip. In April, his Dreamkeeper script will be made into a Hallmark Hall of Fame miniseries for ABC. It follows the fortunes of a Native American teen driving his 102-year-old grandfather to "the last powwow," Fusco says. "The director is Steve Barron, who did Merlin." At first Fusco was reluctant to tackle this theme again, because Thunderheart, which takes place on a South Dakota reservation, had been such a "definitive" project for him. "But some of my Indian friends talked me into it." In June, he returns to a horse theme with the Disney production of Hidalgo, which will be shot in Mexico. Adapted from a real 1890 story, it pits an American cowboy on a pureblooded Indian pony against a Bedouin riding an Arabian steed in the 3000-mile "Ocean of Fire" race across a Middle Eastern desert. Joe Johnston of October Sky will direct. With the world at his command, cinematically speaking, Fusco remains a homebody. "I don't like to leave Vermont, so all these directors fly in here to meet with me. I've got a great racket going," he muses. "Vermont is my spiritual bastion. I hope Rebels will do incredible things for tourism. That would mean a lot to me." His enthusiasm for the state persuaded producer Casey Silver, a former head of Universal Studios who has now formed his own company. "He asked me, 'What do you really want to do?'" Fusco says, "I told him, 'Well, I do have some passion projects.' The first one I pitched was Ethan Allen, and Casey really got it. He flipped out over my first draft." Silver approached Walden, a new production outfit started by Miramax executive Cary Granat and his former Tufts University classmate, Michael Flaherty. The enterprise was inspired by their mutual affection for Henry David Thoreau. "They wanted to do educational films that ignite the younger generation to read," according to Fusco. "This will be their first venture." There's a certain irony in all this attention for Ethan Allen: Plenty of Hollywood types have asked if Rebels is a movie about the furniture business. The chief Green Mountain Boy — whose birthday is January 10 or 21, depending or which historian you believe — was one feisty dude. "There is an original something about him that commands attention," General George Washington once suggested, and Fusco is determined to convey that charisma on screen. As for Allen's "infidel" outlook, Fusco contends that "Ethan's spirituality was akin to Native American religion. His god was manifest in the spirit of the woods. Nature. Vermont, really." The original print version of this article was headlined "A Reel Revolutionary"